Moldavite is the product of a meteor collision with Earth nearly 15 million years ago. In legend, it is believed Moldavite was the green stone in the Holy Grail and has the power to quicken one's spiritual evolution. 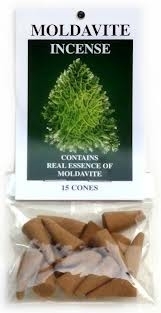 Even those not sensitive to the energies of stones, often feel the energy of Moldavite. Many sense it as heat, tingling or pulsing sensation and even a rush of energy through their bodies typically upwards out the top of their head. 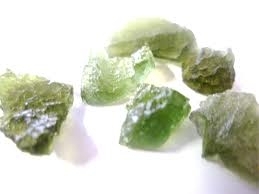 *Moldavite's high vibrational energy is a powerful chakra opener, particularly at the heart and above. *Sleeping with Moldavite activates the dreams state. *Wearing it helps manifest positive life change.